The Evolution Of Gutenberg – Has It Improved? It’s been three months since I last looked at the WordPress Gutenberg editor, so I thought it was time to revisit. The last version I tried was version 0.4. It’s moved on quite a bit since then. We’re now on to version 1.4. 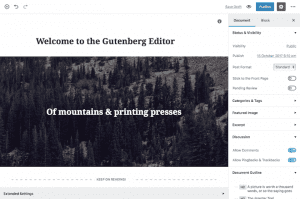 What’s new in Gutenberg? Here are some of the changes I’ve noticed… Continue Reading The Evolution Of Gutenberg – Has It Improved? Web Design: Should You Hire A Freelancer Or Agency? Should you hire a freelance web designer or agency? The question is nearly as old as the web itself. Most businesses can only take on so many employees to handle common business tasks such as accounting, admin and sales. But what happens when you need a website and find that your staff can’t help? You… Continue Reading Web Design: Should You Hire A Freelancer Or Agency?